There have been several articles in the Korean English-language media over the past year or so that have portrayed the community of foreign English teachers as being divided on the basis of visa type as a result of the E-2 visa regulations implemented in late 2007. All of these articles were published in the Korea Times and written by Kang Shin-who. Under the Korean visa rules, native English speakers seeking E-2 visa are obliged to submit police background checks. However, foreigners who are ethnic Koreans or married to Korean nationals are exempt from the requirements as they are eligible for F-4 and F-2 visas, respectively. On January 8, 2009 - three weeks before ATEK's 'Equal checks for all campaign' was announced - the Korea Times published "New Visa Law Angers Foreign Teachers Here" (hat tip to Brian in Jeollanam-do). Many other foreign teachers at private language institutes also complain that the government should apply the same visa screening rules to foreign English teachers holding other visas as those applied to other foreigners seeking E-2 visas. "If the government has decided to tighten the issuance of teaching visas because of increasing number of crimes by foreign teachers, what about other foreign teachers holding other types of visas such as F-2 or F-4?'' said an Australian English teacher in Daejeon. In response, many E-2 visa holders have complained that the government should apply the same visa screening rules to foreign English teachers holding other visas. They are urging the government to use the same restrictions on teachers holding E-1 (professorship), F-2 (spouse of a Korean) or F-4 (ethnic Korean) visas. "The visa rules for E-2 visa holders should be revised as they clearly discriminate on the basis of national origin,'' said Benjamin Wanger[sic], a professor of Kyung Hee University. The article includes the same "the government should apply the same visa screening rules" comment as the previous two articles and also adds the phrase "urging the government to use the same restrictions" which will appear again. This is followed by an unrelated statement from Benjamin Wagner which makes it appear as if he is supporting the previous paragraph. E-2 visa holders have contended that the government should apply the same visa screening rules to foreign English teachers holding other visas, urging the government to use the same restrictions on teachers holding E-1 (professorship), F-2 (spouse of a Korean) or F-4 (ethnic Korean) visas. They made it clear that they don't oppose background checks as a rule. Much of the first sentence in the paragraph above is similar to what was written in February, and the same two phrases appear again, the first one appearing for the fourth time since October. This paragraph was quickly corrected by Kang after a call from Benjamin Wagner. "Meanwhile, foreign teachers' groups are urging the Korean government to test all teachers, whether they are Koreans or foreigners." The phrase "urging the government to use the same restrictions" has been changed to "urging the government to test all teachers," but is obviously very similar. Also interesting is that the article says that the new bills will oblige "foreign English teachers to present criminal record and health check documents, including HIV-AIDS tests, before they are hired at public or private schools." 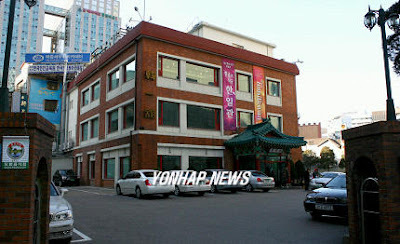 This Yonhap article makes no mention of HIV tests. It has been suggested that ATEK's 'Equal checks for all campaign,' and the wording in their 'cut and paste' petitions to the NHRCK were to blame for news articles which said that ATEK was calling for E-2 visa-style regulations to be expanded to other visa types. The articles in question were the February 4 Korea Times article and a February 5 Joongang Ilbo article; the latter however only states that other visas do not have to submit to the same regulations - it does not call for E-2 regulations to be expanded to other visa types as the series of Korea Times articles mentioned above do. It should be clear that Kang's articles have used the phrase "the government should apply the same visa screening rules" at least four times since October of last year, with two of the articles predating the 'Equal Checks for All' campaign. Considering this, as unclear as the message of that campaign was, I can't see how it could be held responsible for the way it was reported in the Korea Times. I have no idea if this is due to sloppiness or being pressed for time on Kang's part, or if it's due to other reasons. It may be worth noting that Brian in Jeollanam-do has reported that statements attributed to Park Nahm-sheik in an article by Kang from April were said to have been mistranslated or taken out of context, according to people close to Park. I wasn't surprised when I read Brian's post, as I had not had any luck finding his statements in Korean. Another article by Kang from March this year has the supervisor of the Incheon education office, Koo Young-sun, on record saying that, "Many foreign teachers lack teaching methodology and some of them are not ethically qualified to treat children." A Yonhap article on the same topic (in Korean) has no mention of these controversial statements from the supervisor. Perhaps Kang interviewed her and she had words for him that she didn't share with others. Perhaps she did say these statements to Yonhap but Yonhap decided not to print them (well, it's possible). Perhaps there are other reasons. All I can say is that when you see an article written by this author, you may want to take it with a grain of salt. Of course, that applies to any media source, doesn't it? Just how much influence does Anti-English Spectrum have? 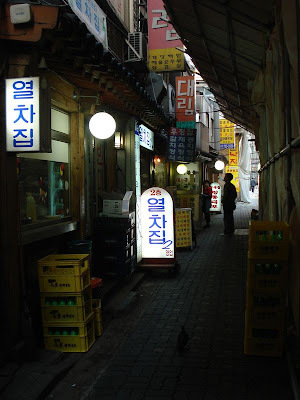 In a 2009 article in the Kyunghyang Shinmun, he explained that "80 percent of those seeking advice at an AIDS counseling center in Itaewon were foreign white collar workers and English teachers." And now, this group has managed to get this same quote placed in the official record of a Bill pending before the National Assembly Legislation and Judiciary Committee that calls foreigners a "threat" to "our people's health." The bill was submitted to the National Assembly on December 30, 2008, but another document regarding the bill was was submitted on February 24, and was discussed before the National Assembly Legislation and Judiciary Committee. 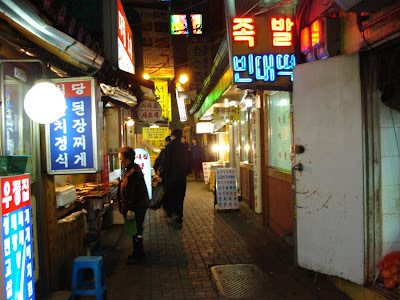 It can be found here (look under 소관위 심사정보, 법제사법위원회 2008-12-31 2009-02-24). Interestingly enough, the person submitting the document argues against the passage of the bill, saying that the health tests that the new bill calls for are already being carried out under Article 11 of the the Immigration Act (which allows for immigration regulations). The example the person gives are the E-2 visa regulations and he or she notes that AIDS tests already fall under these regulations. Therefore, in this person's view, the new amendment is unnecessary. 80 percent of those seeking advice at an AIDS counseling center in Itaewon in 2007 were foreign white collar workers and English teachers. 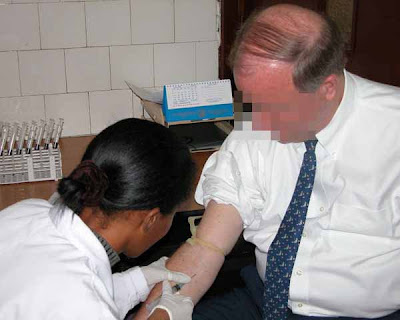 About 60 countries worldwide conduct AIDS tests on foreigners according to the type of visa. To see how similar these sentences are in document and the article, let's look at them in Korean. 2007년 이태원 에이즈 상담소의 에이즈 관련 상담자의 80%가 외국인 화이트칼라 및 외국인 강사라는 사실이 공개돼기도 했다. 사단법인 에이즈협회에 따르면, 전 세계적으로 60여 개 국에서 비자의 종류에 따라 외국인들에게 에이즈 검사를 실시하고 있다. This might not be totally convincing, so here's the smoking gun: In my last post, I mentioned the September 18, 2006 Break News article (here) titled, "At foreigner AIDS testing centers, 80% of users are native speaking instructors." 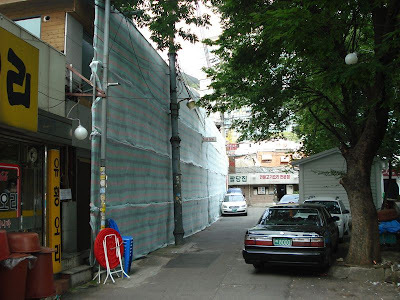 Note above that five days before the document mentioned above was submitted to the National Assembly Legislation and Judiciary Committee, Lee Eun-ung wrote that "80% of the counseled at an AIDS counseling center in Itaewon in 2007 were foreign white collar workers and English teachers." Lee made a mistake. The article was in 2006. In fact, I searched Naver and Daum for any mention of the 80% figure in 2007 and found nothing except posts referring to the 2006 article. Not only is the almost exact same wording found in the document footnote, but the same mistake is found. And as teachers know, you can always tell someone's been copying when they share someone else's mistakes. This should make it clear that Anti-English Spectrum has an audience that extends far beyond their online Naver cafe. But more importantly: Does anyone else find it disturbing that people discussing bills before the National Assembly Legislation and Judiciary Committee are using Break News (or "Inside Story" in it's tabloid paper edition) and a xenophobic online community of unapologetic stalkers as sources? With the connection above made clear, I really start to wonder about the influence the unidentified contributor to the 2006 Break News 'AIDS' article (who the screenshot above strongly suggests may have been a member of Anti-ES) may have had on the 2007 policy memo that led to the current E-2 visa regulations. He wrote that “E-2 visa requirements should be strengthened. […] A medical check certificate (including AIDS) should be added to the documents required for an E-2 visa.” This is exactly what happened, and I'm not sure if there was much discussion of the issue of AIDS and English teachers in the media outside of this 2006 article and the 2007 "AIDS email" story from 2007, which Anti English Spectrum admit they were also behind. While the use of such unreliable and biased sources as Anti-English Spectrum and Break News by lawmakers drafting bills may seem worrying, it may not be that uncommon. I'll save that for another post, however. 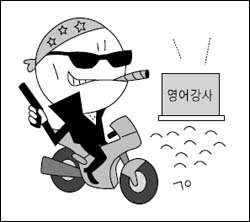 My hat is off to the Hanguk Ilbo for this illustration from an October 2006 article about the arrest of Korean Americans and Koreans deported for the U.S. for gang activity who were in Korea teaching English. I want that as a t-shirt. The Joongang Ilbo has an interesting article about a British soldier killed in the Korean War... and his wife who was buried alongside him at the U.N. cemetery in Busan over 50 years later. It's nice to hear that the family members' trips to Korea were supported by the Korean government. The Korea Herald has an article about director Shin Dong-il's new film "Bandohbi," 'which roughly translates into "female friend" in Bengali', about a friendship between a migrant worker and a teenage girl. At a press conference following the press preview, Shin said his latest film is just the beginning of a genre that focuses on migrant workers in Korea, and he hopes more films will delve into the issue. "It is very regrettable that the rating agency has rated my film as 19 and older, even though the film is concerned about a teenager's perspective about the world," Shin said, adding that the rating agency's decision severely undercuts his intention behind the independent film project. The film sounds interesting, to be sure, but it was the photo that got my attention, since I know the actor. Mahbub Alam Pollob, who appeared briefly in Shin's previous feature "My Friend & His Wife" (2006), said his first role in a feature film was a pure delight. "There were some personal problems I had to deal with, but it was my pleasure to work for this film because it is the first attempt to focus on immigrant workers in Korea," he said. Baek Jin-hee, who has left a strong impression with her impeccable depiction of a quirky yet likable girl, said she found it a "meaningful experience" to team up with a foreign actor. "The only difference with other Korean actors is that Mahbub Alam Pollob has a different skin color," she said. Very cool. I haven't talked to Mahbub in quite a while. He was involved with the Migrant Workers' Union from a long time ago, and was a part of Migrant Workers Television (MWTV) when it first started in 2005, and this seems like a logical progression in his activism and work to focus more attention on the issues of migrant workers. As the Herald article says, "Bandhobi," distributed by Indiestory, will hit select theaters on June 25. Episodes of MWTV can be seen here. "At an AIDS testing center for foreigners, 80 percent of those requesting tests were foreign English teachers."" Lee Eun-ung of Anti-English Spectrum brought this up in his Kyunghyang Shinmun article from February. 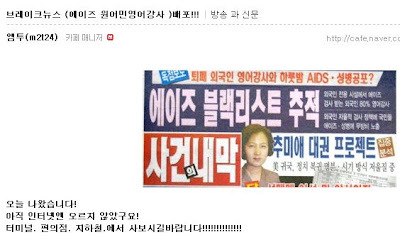 The September 18, 2006 Breaknews article this quote is originally from can be found here (in Korean) titled (in the internet edition) "At foreigner AIDS testing centers, 80% of users are native speaking instructors." Note the lovely photos used in the article. 13 months later, that's what E-2 visa holders got. As to who the contributor might be, or who he represents, it might be worth looking at what appeared on Anti-English Spectrum the day the article was released. This makes pretty clear that they are connected with the AIDS article, and they're very happy that they're no longer just on the internet, but on broadcasts, in newspapers, on subways and in convenience stores. Breaknews (AIDS Foreign teacher) wide distribution!!! The writer of the post is em-tu, who has been identified as 'Mr. Lee' before, and whom I'd imagine is Lee Eun-ung. I would have thought only 12 year old girls would use so many exclamation marks, but hey, expanding their despicable smearing tactics from the internet to the press really must have been really exciting for them. Below is an interview with Lee Eun-ung, where he admits that he contributed the story reenacted below to the 그것이 알고싶다's episode about English Teachers, titled "Is Korea their Paradise? Report on the Real Conditions of Blond-haired, Blue-eyed Teachers," which helped shape the image of English teachers as unqualified, pot-smoking child molesters. 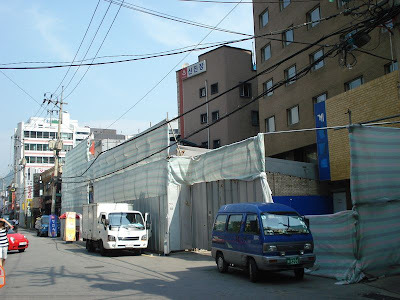 For months much of the Pimatgol/Cheongjin-dong area north of Jongno between Gwanghwamun and Jonggak Station has been shrouded by steel and blanket fences in preparation for demolition. Over the last month or so most of the cordoned-off area has been demolished. 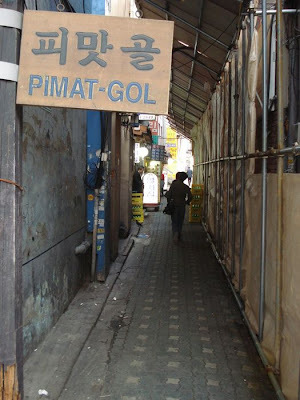 "Pimatgol, the back alleys of Seoul"
"Disappearing Chongno P'imat-gol 'Taste Alley'"
"The Memories of Pimatgol Disappearing"
If you have time to read only one article, read the unedited version of Scott Burgeson's "Annyong, P'imat-gol" (Newsweek Korea, 2009.06.24). Go read it now. It's the best informed, and, seeing as a couple of the visits to the area documented below were with Scott, it's the article most related to this post. Scott has also posted photos of the neighborhood in happier days. 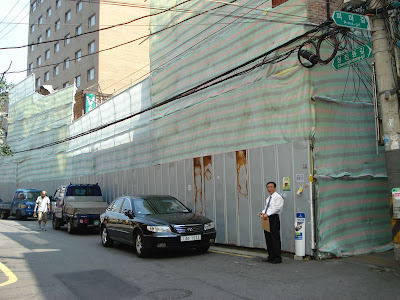 This photo is of the Seoul Hotel, the interior of which (along with the surrounding area) was photographed by Jon Dunbar. This map shows where redevelopment is supposed to take place in Cheongjin-dong. In fact, more of the area is being demolished than what is seen here, including the area just north of '1', and a section of the area between '1' and '2.' The area may end up looking like what is shown here, or it may not. 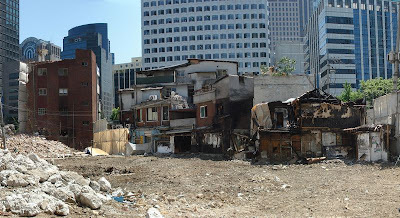 I have another post in mind which will look at what the previous destruction of another section of Pimatgol in 2005 (to build the lovely 'Jongno Town' building) has meant for the preservation of Pimatgol, but I'll leave that to another time, and for today mostly just post photos of the area. 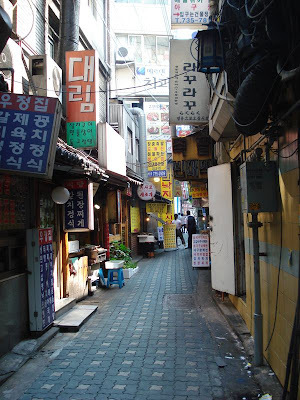 The most picturesque part of Pimatgol was the section right next to the Kyobo building. 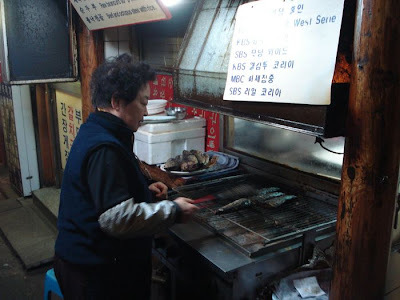 Seok said many of her more frequent customers return to Pimatgol because they spent time here in their youth. “They’re mainly in their 40s and 50s and have children of their own now,” Seok said. Relationships are tight and the shared history creates a bond. Seok’s even been invited to some of her customers’ weddings. “They may not be as handsome as they used to be, but they are always welcome in my house,” she added. What does Pimatgol mean to her? “It’s where common people live their daily lives and where life is full and cheap,” she said. Scott spends some time talking about her in his article (and has a great photo of her), and back in February he and I had dinner there together. 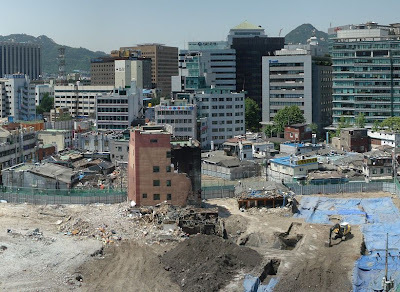 Actually, that day I had been in Hyehwa-dong trying to get a good photo of Hyehwamun (and trying to find the way up to the city wall) and discovered this demolished lot next to the city wall. I had to slip in through the 'blanket fence', and ended up getting fibers from the blanket all over my backpack (which were pretty difficult to remove). As we went up to pay, she noted my backpack and asked what was all over it, and Scott joked that I was homeless. When we got the change back, Scott noticed that there was too much and asked why. Mrs. Seok's response was, "It's a homeless discount." Somehow I doubt those working in the shops in the office tower that replaces the neighborhood will be quite so friendly. In mid-May I stopped by to take a look at the area (Jon Dunbar has photos of the area taken at the end of April). This was the view coming out of Kyobo Bookstore. 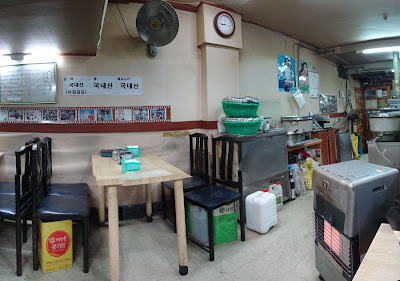 It was nice to see that Yeolcha-jip and Daerim were still open (and were as of last weekend). 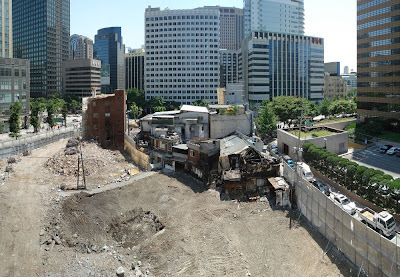 The buildings facing Jongno were being destroyed (interesting how you can see the outline of the formerly adjacent building against the remaining one). Here was the view of the area from above, taken from the 'Bikini University' building nearby. It was possible, from Pimat-gil, walk out into the demolished area seen above. 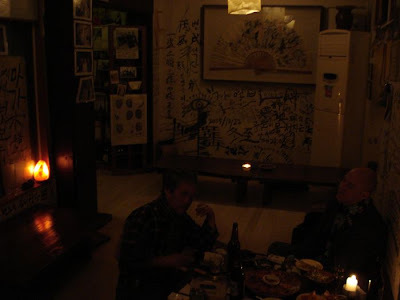 At the end of May, I returned to the area with my friend Blaz, who's been teaching urban studies in Seoul. This was the overview of the area then. 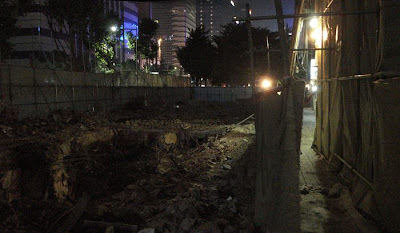 Next to Jongno, the destruction continued. 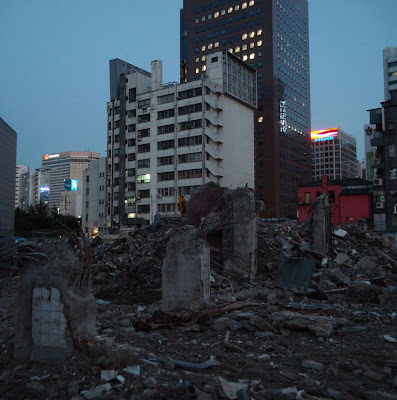 Last Sunday night I took a photo from almost the same vantage point; the buildings along Jongno are all gone now. 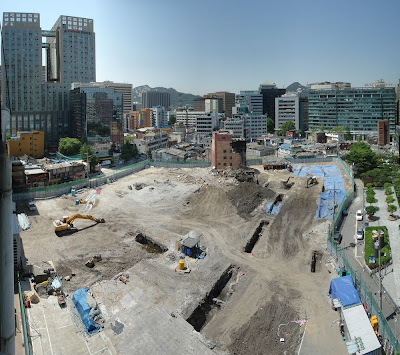 As I mentioned, the map above does not show this redevelopment, in the northern section of the same block next to the Kyobo Building. Here it is looking north from the Bikini University building. The only positive development to come from this would be the results of archeological digs on the site after the buildings were cleared. 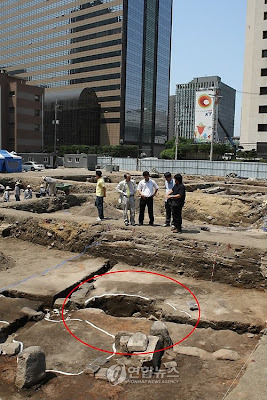 Photo from here (note the Kyobo Building at left). The managed to find some good examples of pottery from the 1500s or 1600s. 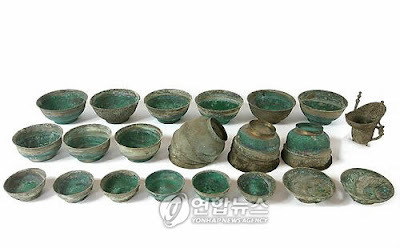 To see what these looked like when they were found, see here. Other pottery was found as well (and there is more here). 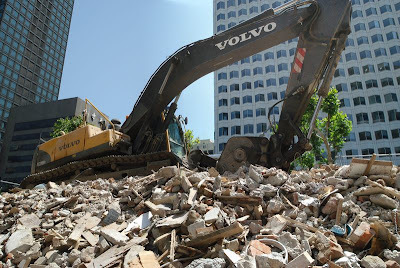 As redevelopment or restoration projects have proceeded in the downtown area over the past few years, the discovery of ruins and pottery has become more frequent. 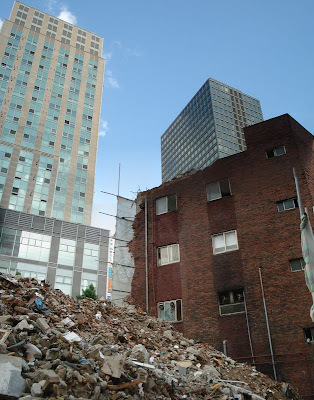 We headed over to the other block of Cheongjin-dong being destroyed; or perhaps I should say, "that has been destroyeed." At bottom right used to stand the restaurant Hanilgwan, which had almost 70 years of history and served former presidents. 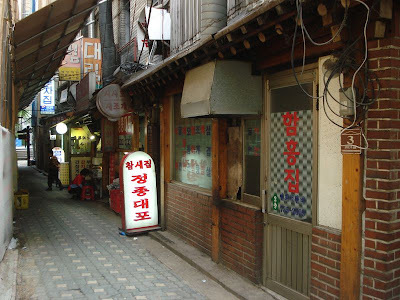 Hanilkwan, a traditional Korean restaurant located in Jongno, Seoul, will suspend its 70-year service for a reconstruction project in the area in May. 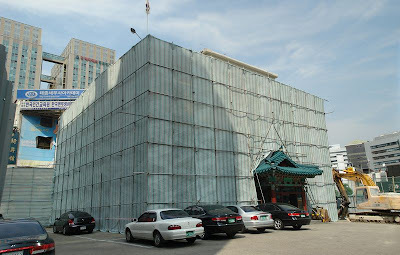 The famed restaurant will move to Gangnam, southern Seoul. ``We are moving, not completely closing. 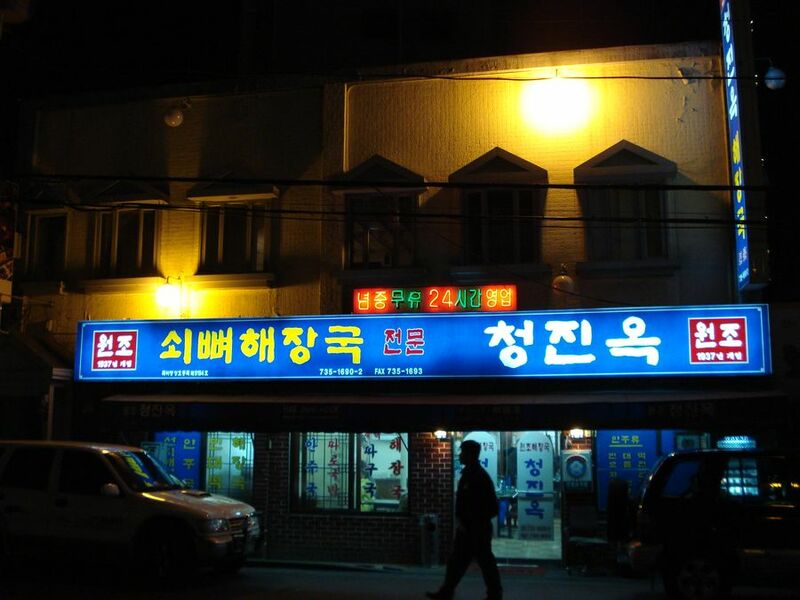 Still, the staff and our customers feel sad that we have to leave where we established so much so long ago,'' said Kim Jung-ok, the restaurant's executive manager. Here's what it looked like in September. 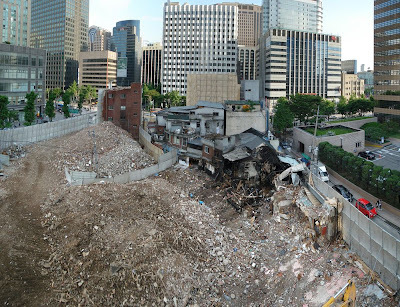 As of the end of May, there were only two buildings left: a hotel, and a still-operating restaurant with a partly demolished hanok behind it, which can be seen below. It also appears that archeological excavations have started in this former neighborhood as well. Here's what the entrance to the hotel once looked like. As of the end of May, the area was tightly sealed shut, but two weeks earlier it was possible to pop in for a look around after workers left. 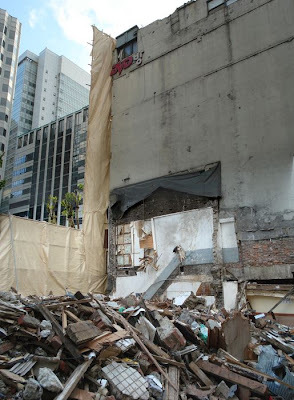 Easily noticeable was this partly demolished hanok. I wondered if I had actually been there before, but dismissed it as unlikely. I took a few photos with the flash on. It wasn't until I got home and looked carefully at the photo above and the one below that I realized I had indeed been here before - I described the visit in this post two and a half years ago. I went with Scott Burgeson, and he mentions this place, named Si-in Tongshin, in his article. Here's the photo I took at the time, of the poet who befriended us and Scott. 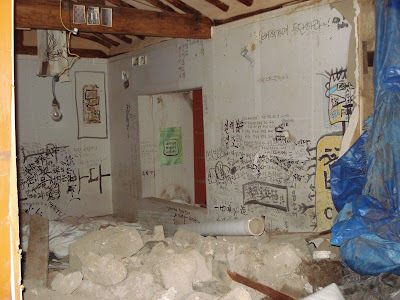 A close look at the writing on the wall reveals it to be the same place as the partly demolished hanok above. 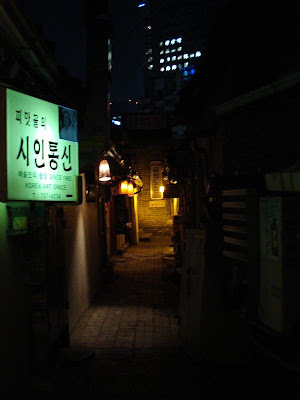 This is where I was introduced to Lee Jang-hee's 'Geugeonneo,' which is a really cool song, but very unlike the rest of Lee's folk-oriented music from that time. Here's the entrance to and sign for Si-in Tongshin. 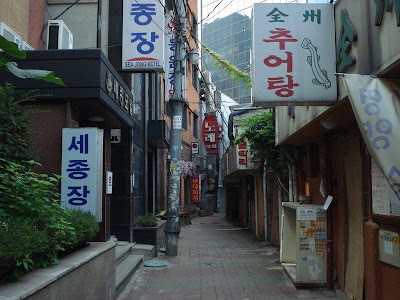 Over in the direction of these ruins was once Cheongjin-ok, the haejangguk restaurant which dates back to 1937. Here is how it once looked. 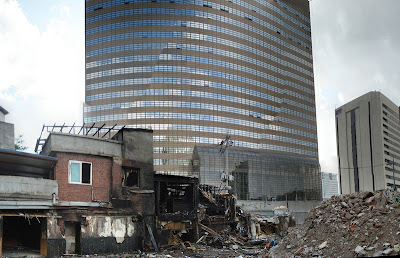 Here is how it looks now after moving into the north end of the Jongno Town building. 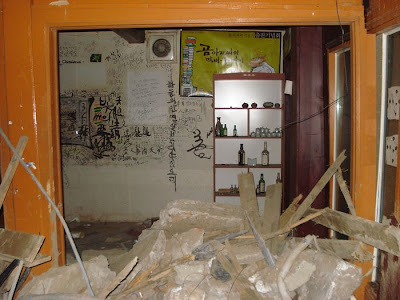 The inside the building there is a photo of the old restaurant. [M]ost restaurant owners say everything is different from the way it used to be. 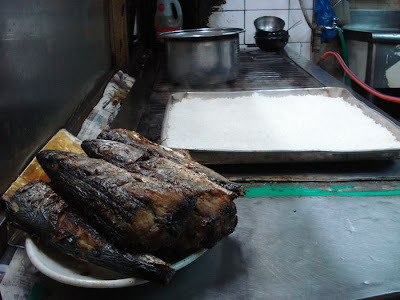 Some restaurants had to raise prices due to the high rent and hike in prices of food supplies. 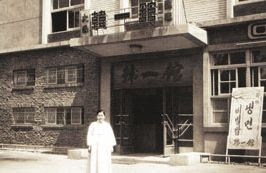 Cheongjinok, a blood soup restaurant, was a fixture of Pimatgol established in 1937. 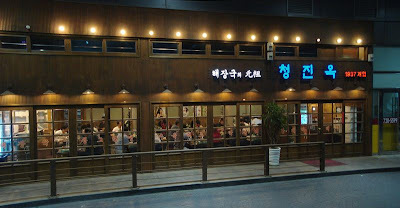 The restaurant has moved to the first floor of the Le Meilleur building last August and raised the price of main dish "ttaro gukbap'' (rice served with blood soup) to 6,000 won, a 500 won increase. 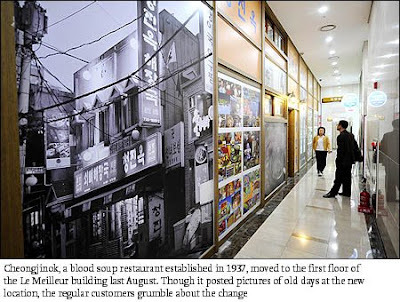 Mijin, a buckwheat noodles specialty eatery, also moved to the first floor of Le Meilleur, and raised the price of the noodle by 1,000 won to 6,000 won, the only price hike in eight years. As the redevelopment plan is carried out, more restaurants are expected to move to the building. 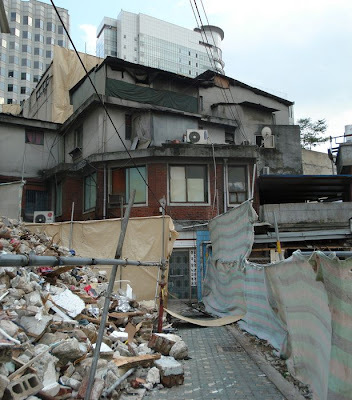 "If the owner wants to keep running the eatery in this area, there is no other option than the Le Meilleur building for the present,'' a real estate agent in Jongno said. "[N]o other option than the Le Meilleur building"? That's one way to rub salt in the wound. But there's more, of course. 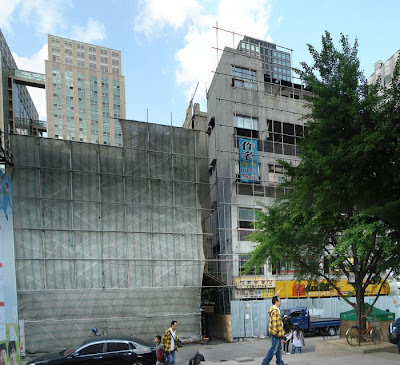 The building requires a 100 million won deposit and 5-7 million won monthly rental fee for a first floor unit, the most expensive in the building and two to four times costlier than restaurants' previous locations. I guess that's the price of progress. I'll save my thoughts on what this means for downtown Seoul for another day. "My, what a big nose you have"